Daddy & Me is here! 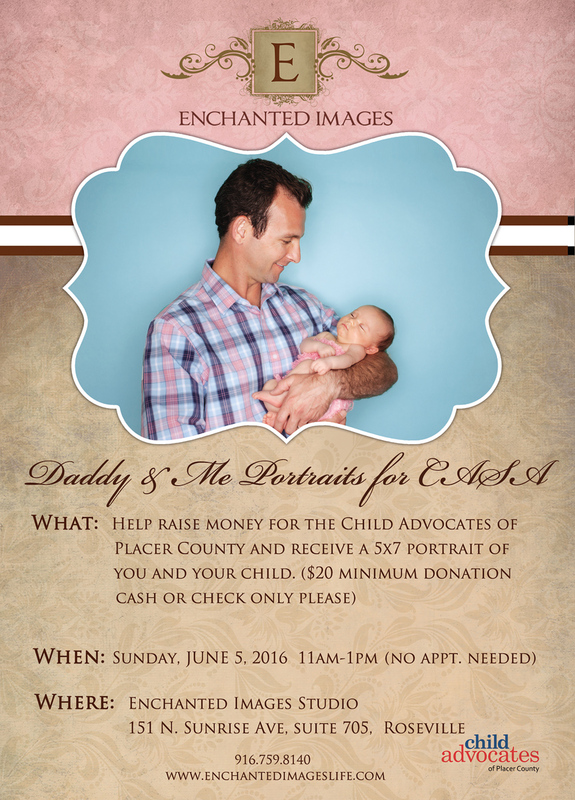 We are pleased to announce the return of our Daddy & Me portrait charity event. The background for the event will be a lovely light blue (the same as this year’s Mommy & Me portraits, which would make for an adorable side-by-side!). Feel free to bring children of any age, and why not add in a grandfather or great-grandfather for a generations portrait? We welcome multiple setups for one group; you just will make a separate donation to one of our favorite charities, Child Advocates of Placer County (CASA), for each grouping. As with our other charity events, you will receive a 5×7 print of the best image, chosen by us (those who opt to pre-order a digital image file at the event will choose your favorite image on the spot). The prints will be available for pickup Friday, June 24 and Saturday, June 25 from 12-1pm. If a digital file is purchased, those will be delivered via email by Thursday, June 9. We are excited to be bringing this event back and hope to see you all there!